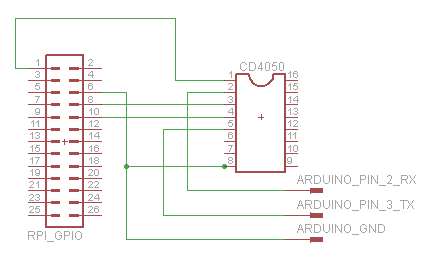 NOTE: This is an older post, and instead of using a CD4050 it might be easier to use a bi-directional level shifter module. In an attempt to get my Raspberry Pi talking to my Arduino I’m exploring various different options. The first was to just use the USB connection, but that was too simple. 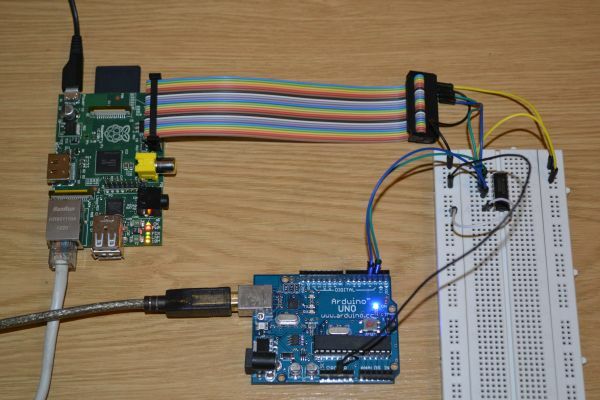 So, here is how to connect the two using the UART on the GPIO pins of the Raspberry Pi. To make testing easier I wanted to keep the Arduino’s serial connected via USB to my PC so I can print messages there and read it with the Serial Monitor. 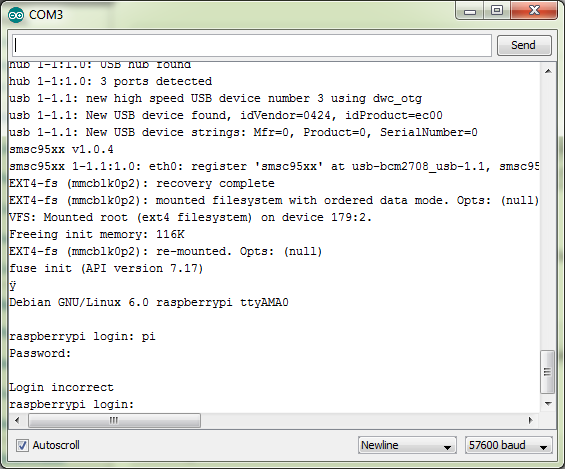 This meant using the SoftSerial library to implement a second serial port to talk to the Raspberry Pi. To protect my Raspberry Pi and to convert the 5V of the Arduino to 3.3V the Raspberry Pi needs I used a CD4050. To show how this works the Arduino is running a small program that reads from the Raspberry Pi’s and copies this to my PC via USB. If you change ‘No Line Ending’ to ‘Newline’ you can enter your username and are then prompted for a password. Unfortunately the password doesn’t work. I still need to figure out why it’s not accepting my password. I suspect it’s to do with a line termination character or something. Next step to connect this with a Serial library on the Raspberry Pi to talk to the Arduino. Maybe using pySerial like Dr Monk did in his Raspberry Pi and Arduino project. You should be able to use this in exactly the same way after disabling the console and getty and using ttyAMA0 as the serial port. Fantastic walk-through. I can’t wait to check one out in person and just wrote my raspberry pi post. So many possibilities, but this is the first good tutorial I’ve seen on arduino integration. I Rebuild your setup for my own purposes. Works very good, thanks for this walktrough. But i have some issues aswell. Even at 9600 baud there are dropped chars. This could even be the solution for your not working password. By setting the baudrate even lower, it works fine for me but sometimes there still missing or wired characters. I’m still not sure why. Did you do any progress with your setup since you posted this article? I did do a bit more work and also noticed dropped characters when sending data from the Arduino to the Raspberry Pi. I’ve not worked out exactly why yet, but when I changed the PC Serial to 9600 to match the 9600 between Arduino and Raspberry Pi the dropped characters stopped. thank you. just had to do some little adjustments to set up the Arduino Mega because the serial ports are named differently (Serial, Serial1, Serial2). Everything works just fine. I can log in by setting Carriage Return in the serial monitor. Hi! Awesome work! I’ll try to implement your setup as soon as I manage to get a Pi. Sorry, the automated error correction merged doubled minuses into a single one. It works fine here, also I replaced IC CD4050 by a pair of optocouplers 4n25. I would like to read bytes from the RPi UART RX – but I don’t know what the name for RX is. From your tutorial I gathered that TX would be ttyAMA0, is that correct? What about RX? If you could briefly explain and give me some pointers, I would greatly appreciate it. hi, I do not understand something in the connection. The TX Arduino is 5 volts and could break the raspberry and where you use the CD4050 to reduce the voltage from 5v to 3.3v. But in the opposite case, that is, the TX of raspberry (3.3v) because it can not be connected directly to the ‘RX arduino without going through the CD4050 seen coming out to 3.3ve so do not ruin the Arduino?